We adopted Dirk 4 years ago at our local shelter (where many of our German Shepherds come from) - he is now 6 years old. 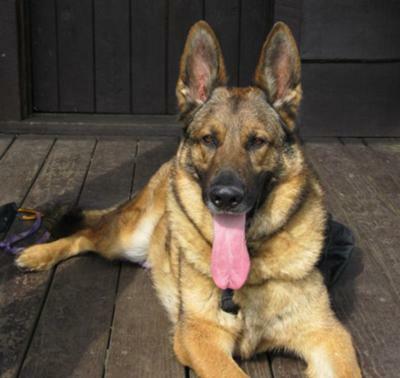 All of our German Shepherds have been amazing dogs and each one has been special to us in a different way. I love to hike in the Adirondacks and discovered Dirk enjoys it as well. I never feel afraid to go hiking alone when I have him with me. He is the most loyal and trustworthy hiking partner a gal could ask for. He meets fellow hikers with a tail wag unless they mistakenly approach me in a way he feels could be considered aggressive. He also gets along with all other dogs. We often meet other dogs on our walks and hikes and he is always very polite and cordial and never tries to lunge or drag me around. Dirk even climbs all the fire towers no matter how high they are. He comes down the steep stairs just as eagerly as he goes up and he is up for any challenge the Adirondacks offer him. He is an amazing dog and I am thankful every day for adopting him and giving him a second chance. Dirk likes to hang out with my husband, but only when I am not home! The minute I am home he forgets all about my husband. One time my husband was going to take him for a ride before I got home from work. I had just gotten home as they were leaving our driveway. Dirk looked all happy to be going for a ride until he spotted me. He kept his eyes locked on me as they pulled out of the driveway and moments later they came back. My husband said he could not stand the fit he was throwing and brought him back home to see me! You can't find that kind of loyalty anywhere else! So, for the reasons above and many more I did not mention - I think Dirk deserves to be the German Shepherd Dog of the Month on your website! I have very much enjoyed all of Karla's pics of her and Dirk hiking the Adirondacks. I live a long ways away, and I sure wish I had the chance to know him. Karla and Dave once took a German Shepherd for me that I could not keep, and I could not have made a better decision for Cagney. She was a great dog and deserved the excellent home she was lucky enough to get with Karla and Dave. Happy trails, Karla and Dirk! Keep those pictures coming.